A disease that affects mainly the end of the respiratory tract – alveoli and interstitial tissue of the lungs, called pneumonia. The disease may arise primarily in the penetration of respiratory pathogenic micro-organisms or secondarily as a complication of other diseases. 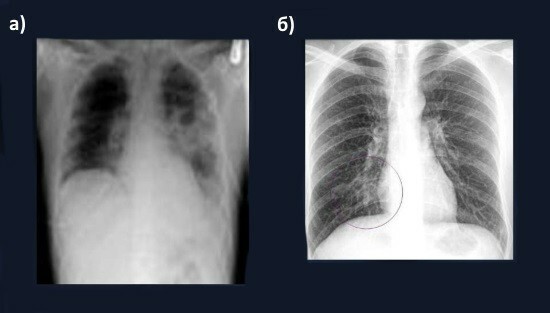 Depending on the varieties of pneumonia x-ray shows a different picture. Changes in the picture gives an indication of the stage of the disease, presence of complications and indicate the likely pathogen. 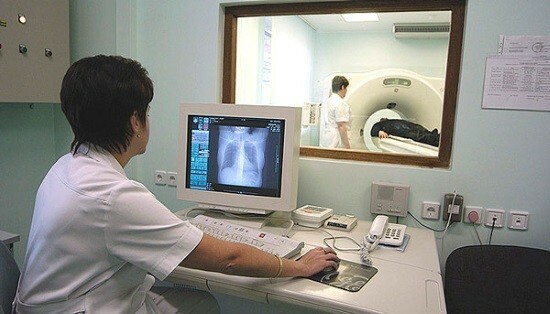 X — ray mandatory method of instrumental diagnosis of pneumonia. Additional procedures are shown for pneumonia, in addition to laboratory tests and examination include CT scan, ultrasound, and bronchoscopy. They are not routine methods and are assigned according to indications. 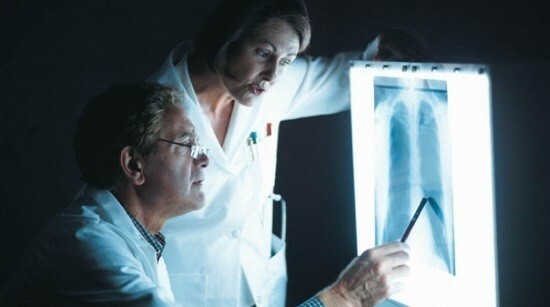 Other diagnostic procedures examination of the chest, MRI, scintigraphy, and pneumonia uninformative. X-ray is in a vertical position when holding the breath on the inhale. Clothing and jewelry from the chest and neck should be removed. The appearance of the picture shows shadows from metal buttons, rivets, buttons misleads the radiologist can stop to consider the pathology of the respiratory system. 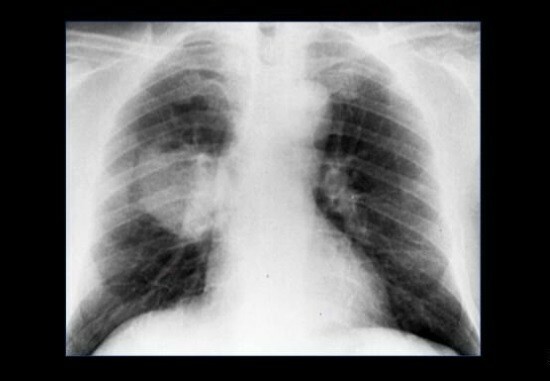 A chest x-ray when pneumonia occurs in 2 planes: frontal and lateral. Radiography in the supine position on the side (laterografiya) is set to detect fluid in the pleural cavity. This picture is taken, if the effusion is small and in a vertical position on the picture of pleurisy is overlaid with a shadow of the main pathological process. When you run naturography exudate spreads along the chest wall. However, the ability to conduct ultrasound examination makes it inadvisable for the appointment of additional images. Ultrasound is more informative in assessing the state of the pleura and pleural cavity, and does not expose the patient to risk of radiation. X-rays of the chest, made a film unit, is accompanied by a radiation exposure of 0.3 mSv, digital – 0,03 mSv. When doing shots for pneumonia? Clinical picture: acute onset of illness with a rise of temperature above 38°C; cough, accompanied by expectoration of sputum. Data of examination: percussion revealed dullness of sound on some regions of the lung; auscultation rales are heard, crepitus, breathing hard. Indicators analysis of blood: increased number of leukocytes, the prevalence of band forms. X-ray is performed not only to diagnose but also to monitor changes in the dynamics. Control is usually carried out 2 weeks after the initiation of antibiotic therapy. Of course, complications occur, additional pictures doing before. The pattern of pneumonia on the x-rays varies depending on the stage, localization and prevalence of pathological process. Has the value and type of pathogen. It has an impact on the course of the disease, which manifests characteristic changes on radiographs. So, staphylococcal pneumonia is more severe, in 25% of patients are accompanied by necrosis of the lung tissue and the appearance of abscesses. At the stage of the tide (the first 2-3 days of the disease the alveoli are expanded and filled with exudate) airiness of pulmonary tissue is slightly reduced, pulmonary pattern is reinforced, expanded root of the lung on the affected side. Under obucheniya (lasts 3-5 days, is deposited in the alveoli of the fibrin in the exudate infiltrating blood cells — first blood cells, then white blood cells) swing sharply reduced, the root of the lung on the side of the pathology extended adjacent thickened pleura, pleural cavity may be determined by the exudate. The image illustrates the intense shadow in the projection of one or more shares. At the stage of approval (usually in 7-10-th day of illness) pulmonary pattern is reinforced, the root of the lung enhanced, shadow reduced and fragmented. Enrichment of lung pattern and expansion of the root of the lung persists for months after the disappearance of clinical manifestations. Bronchopneumonia (inflammation extends to the bronchioles; sites of lesions are small, are positioned within one or more slices). 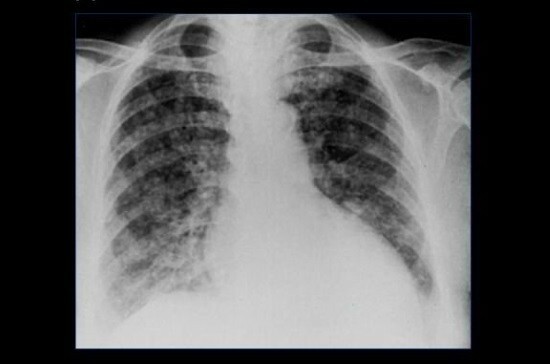 Characteristic x-ray characteristic of this form of pneumonia – focal shadows of different sizes with indistinct outlines. Areas of darkening with a diameter of 2-3 mm are called miliary, 3-4 mm small, 5-9 mm medium 10-15 mm large. When the drain option bronchopneumonia separate foci unite into foci that are larger than 15 mm. Pulmonary the drawing is amplified, the root of the lung on the side of pathology expanded, often there is the seal of the pleura and the emergence of exudate in the pleural cavity. Acute interstitial pneumonia (viral, atypical). There is a significant increased pulmonary pattern, the roots are not changed, the pleura condensed. Progression of disease on x-rays become visible focal darkening in the lower and middle parts of the lungs. Pneumonia may occur as a complication of other diseases. So, the weakening of myocardial contraction, some of the heart defects lead to the violation of the outflow of blood from the vessels of the small circle, thereby creating conditions for the emergence of the congestive pneumonia. A snapshot in the development of this disease is the shadow of the heart increased lung roots are expanded, the pulmonary pattern is reinforced, the lightness is reduced, visible small and large focal shadows predominantly in the root zone. Typical pneumonia is evident on x-ray in the form of the dimming of different sizes. Pulmonary pattern is reinforced, the root of the lung expanded, the adjacent portion of the pleura is sealed in the pleural cavity is often determined by the exudate. What are the complications of pneumonia on radiographs? The characteristic feature of exudative pleurisy is intensive homogeneous shadow in the lower lung with oblique upper border. In the horizontal position, the fluid spreads evenly reducing the transparency of the lung fields. The abscess looks like a ring-shaped shadow with a fluid level. When alveolar edema in the lower lung seen multiple vague focal shadows, merging with each other. In the horizontal position described changes are detected in the root zone and nudepregnancy departments. The preferential localization airless areas in the Central region of the lower parts of the lungs leads to characteristic patterns reminiscent of butterfly wings. Due to heart disease and congestive pneumonia may develop interstitial edema. In this pathology reduced transparency of the lung tissue (symptom of «matte glass»), the roots of the lung expanded, the pulmonary pattern is reinforced and deformed, visible line curly (linear dimming in the basal parts). In addition to the above possible complications, and other unpleasant effects: toxic shock, endocarditis, meningitis, pericarditis, and others. However, in this article, they will not be presented. CT is superior in informative x-rays. However, to assign this study every patient with pneumonia is not necessary. Imaging is usually necessary for differential diagnosis with other disorders of the respiratory system. With the apparent pneumonia of changes on the radiograph is not detected. Atypical pneumonia pattern in the picture. Prolonged duration of pneumonia (infiltration there is more than a month). Relapse with appearance changes in the same proportion. Ultrasound is preferable to x-rays in cases of suspected pleural effusion. Study reveals even small amounts of fluid in the pleural cavity and it is not accompanied by radiation. Is safe during pregnancy. Bronchoscopy with biopsy is performed when pneumonia is rare. The need for invasive obtaining of material for research arises in case of suspected cancer, tuberculosis or infection by microorganisms, poorly detected by other methods (fungi, Pneumocystis jirovecii). To fence endoscopic biopsy is necessary to resort if you cannot obtain sputum for analysis by non-invasive methods, as well as the ineffectiveness of the empirical, that is assigned to obtain information about the pathogen, antibiotic therapy. Panoramic picture of the teeth: how to do, and for what?